The 1923 Rose Bowl, played on January 1, 1923, was an American Football bowl game. It was the 9th Rose Bowl Game. The USC Trojans defeated the Penn State Nittany Lions 14-3. Leo Calland, a USC guard, was named the Rose Bowl Player of the Game when the award was created in 1953 and selections were made retroactively. It was the first bowl game appearance for both the University of Southern California and Pennsylvania State University football teams. It was also the first Tournament of Roses football game held in the newly constructed Rose Bowl Stadium, although games had been played in it prior to this game. The 1924 Rose Bowl was a postseason American college football bowl game played between the independent Navy Midshipmen and the Washington Huskies, a member of the Pacific Coast Conference (PCC). The game took place on January 1, 1924, at the Rose Bowl stadium in Pasadena, California, closing the 1923 college football season. The game opened in front of approximately 40,000 people and ended in a 14–14 tie. It was the first post-season bowl game for both teams. The 1924 game was the tenth edition of the Rose Bowl, which had first been played in 1902. Following the inaugural game's blowout score, football was replaced with chariot races until 1916. The Rose Bowl stadium had been constructed in 1923, making this edition the second game played in the arena. The game's organizers had previously selected a team from the East Coast and the West Coast, and asked the Washington Huskies to represent the West Coast. Washington requested that the Navy Midshipmen be their opponents, and Navy accepted. Washington selected Navy in favor of several teams from the east which had amassed better records. Both teams had suffered only a single loss during the season, but Washington had won eight games compared with Navy's five, although Navy had also amassed two ties. Predictions gave Washington a slight advantage in the game due to the weight difference between the teams: the Washington players were on average 10 pounds (4.5 kg) heavier than those of Navy. The game kicked off in the afternoon; heavy rain showers had fallen the day before, causing a slight delay. The first quarter was scoreless, but Navy scored a touchdown on the first play of the second quarter. Washington answered Navy with a 23-yard touchdown run on the next drive. Near the end of the second quarter, Navy scored a touchdown on a two-yard run, giving them a 14–7 halftime lead. The third quarter was a defensive stalemate as neither team scored. Navy fumbled the ball on their own ten-yard line late in the quarter. Four plays afterward, Washington tied the game on a 12-yard touchdown pass. Navy threw an interception at midfield, and Washington drove down to the Navy 20-yard line before attempting a game-winning field goal. The kick missed and the game ended shortly afterwards. For his performance in the game, Navy quarterback Ira McKee was named the Most Valuable Player. Navy led in nearly every statistical aspect of the contest. Washington returned to the Rose Bowl at the end of the 1925 season, falling to the Alabama Crimson Tide 20–19. Navy did not participate in another bowl game until 1955, when their squad, nicknamed the "team named desire", upset the Ole Miss Rebels in the Sugar Bowl. Since the 1924 Rose Bowl, Navy and Washington have met five more times; the Huskies won three of the games. The 1934 Rose Bowl, played on January 1, 1934, was an American football bowl game. It was the 20th Rose Bowl Game. The Columbia Lions defeated the Stanford Indians (now Cardinal) 7-0. Cliff Montgomery, the Columbia quarterback, was named the Rose Bowl Player Of The Game when the award was created in 1953 and selections were made retroactively. At 35,000, it has the lowest attendance in the Rose Bowl game since the Rose Bowl Stadium was built in 1922. This was one of the few rainy New Year's Day celebrations in Pasadena, California. Rain three days before had turned the Rose Bowl stadium into a small lake. The 1943 Rose Bowl game, played on January 1, 1943, was the 29th Rose Bowl game. The University of Georgia Bulldogs defeated the UCLA Bruins 9-0. The game returned to the Rose Bowl stadium after being played at Duke Stadium the year before. Charley Trippi of Georgia was named the Rose Bowl Player of the Game when the award was created in 1953 and selections were made retroactively.After the 1942 Allied victory in the Battle of Midway and the end of the Japanese offensives in the Pacific Theater during 1942, it was deemed that the West Coast was no longer vulnerable to attack, and the Rose Bowl game continued on in the Rose Bowl Stadium. Few Georgia fans were able to make the trip because of travel restrictions. There were a large number of military servicemen in attendance. The Tournament of Roses parade itself still was not held due to the war. Due to the number of American servicemen stationed in Australia, the game was broadcast live on Australian radio. The 1983 Rose Bowl was a college football bowl game, played on January 1, 1983. It was the 69th Rose Bowl Game. The UCLA Bruins defeated the Michigan Wolverines by a score of 24–14 in a bowl rematch of a regular season game also won by UCLA. Tom Ramsey, UCLA quarterback and Don Rogers, UCLA defensive back, were named the Rose Bowl Players Of The Game. This was the first season that the UCLA Bruins played in the Rose Bowl stadium as their home stadium, where they were undefeated. The 2000 Rose Bowl was a college football bowl game played on January 1, 2000. It was the 86th Rose Bowl game and was played on January 1, 2000 at the Rose Bowl Stadium in Pasadena, California. The game featured the Wisconsin Badgers defeating the Stanford Cardinal by a score of 17–9. Ron Dayne, the Wisconsin running back, was named the Rose Bowl Player of the Game for the second consecutive year. Brookside Golf Course is a municipal golf facility in the western United States, located in southern California in Pasadena. Adjacent to the Rose Bowl stadium in the city's Arroyo Seco Natural Park, the 36-hole facility offers the C.W. Koiner Course (#1) and the shorter E.O. Nay Course (#2), divided by the concrete-channeled Arroyo Seco. Both courses were designed by architect William P. Bell and the complex features a restaurant, banquet facilities, meeting rooms, pro shop, two practice putting greens, a chipping area, a practice bunker, and a driving range. The course hosted the Los Angeles Open on the PGA Tour in 1968, won by Billy Casper in late January. Joel Antonio Aguilar Chicas (born July 2, 1975) is a Salvadoran football referee. He has been a full international referee for FIFA since 2001. Aguilar was selected as a referee for the 2007 FIFA Under-20 World Cup in Canada, where he refereed the matches between the United States and South Korea on June 30, 2007, New Zealand and Gambia on July 5, 2007, and Austria and Chile on July 8, 2007. Aguilar was selected as a reserve official for the 2010 FIFA World Cup. Therefore, he did not officiate in any matches during the tournament except as a 4th official. Memorial Park is a below-grade light rail station in the Los Angeles County Metro Rail system. 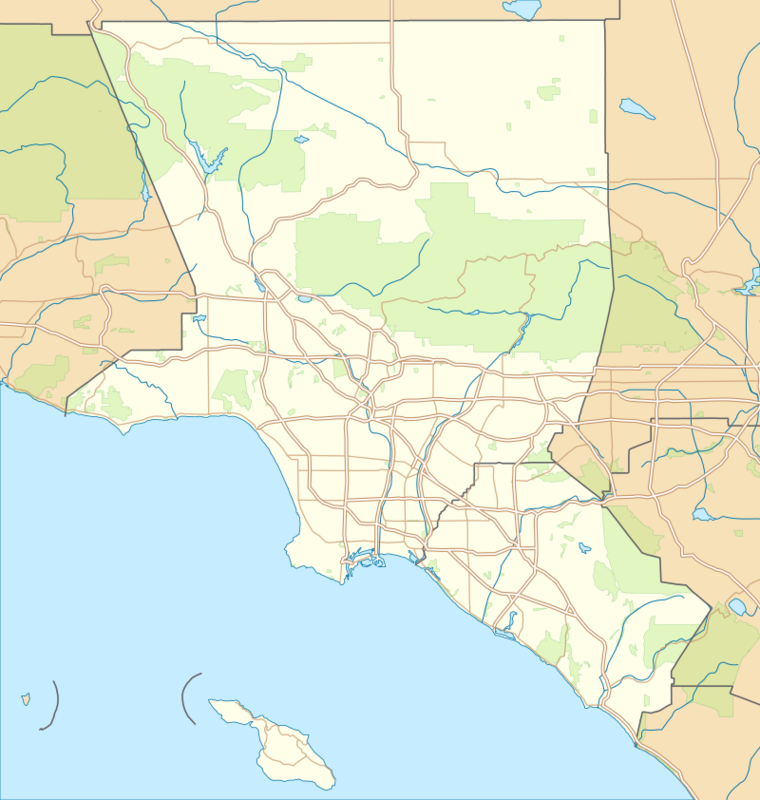 It is located at Holly Street and Arroyo Parkway in Pasadena, California. The station is served by the Gold Line.Situated on the northern edge of Old Town Pasadena, Memorial Park Station is located in a trench beneath the Holly Street Village Apartments, which were constructed in 1994 in anticipation of a light rail station at this site. This station features station art called The First Artists in Southern California: A Short Story, created by artist John Valadez. It is one of the Gold Line stations near the Rose Parade route on Colorado Boulevard and is heavily used by people coming to see the parade and to take the shuttle to the UCLA football games and the Rose Bowl Game at the Rose Bowl stadium. During the 2028 Summer Olympics, the station will serve spectators traveling to and from the Rose Bowl. The Rose Bowl Aquatics Center is a pool facility located in Pasadena, California adjacent to the Rose Bowl Stadium. It is best known as the training facility for the Rose Bowl Aquatics swim club, as well as Rose Bowl Masters swimming, Rose Bowl diving teams, and the Rose Bowl water polo club.